Many medical experts recognize that silver is a highly powerful germicidal. It is an antimicrobial: antibacterial, antiviral, antifungal, sanitizing antiseptic that is entirely non-toxic to humans when prepared and used correctly. 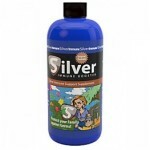 “Colloidal silver just might be the next germ-fighting wonder drug. And not just for the serious threats making headlines: It’s also effective against bacterial infections like strep throat, viruses like the flu, and fungal infections like Candida. No matter how much a germ mutates, it can’t change enough to escape the damaging effects of colloidal silver. “I’ve touted the benefits of pure micro-particle colloidal silver for years to anyone that would listen. Frankly, it’s the best way I know to quickly heal cuts, scrapes, sores and burns . . . treat a host of common illnesses such as colds, flus and sore throats . . . as well as kill nasty germs on cutting boards, kitchen counters, tooth brushes and even your pet’s water bowl. ~ Dr. Michael Cutler, M.D. Spray directly onto your body, to heal sores and to keep cuts, burns or scratches from becoming infected. Spray meats and other fresh foods before refrigerating, to kill nasty pathogens such as MRSA. Spray onto cutting boards and kitchen counter tops to kill germs after you’ve prepared food. Soak fruits and vegetables to eradicate potentially harmful bacteria and fungus from the food surfaces. Clean and decontaminate faucets, door knobs, and other contact surfaces. Add a couple of ounces to laundry as a natural antiseptic agent. Soak your toothbrush to prevent microbial contamination. Spray around sinks, bathtubs and other surfaces to stop mold and mildew in its tracks. Spray it topically onto cuts and burns for prevention of infection and to stimulate rapid wound healing. Add it to your pet’s water bowl to resolve internal infections and help prevent illness. Gargle to eradicate sore throats. Using a spray atomizer, sniff it up your nose to eliminate sinus infections. Add a drop or two into your eyes to stop Pink Eye or styes. Use internally to help stop infections like colds and flu, alleviate intestinal infections, stop urinary tract infections, alleviate upper respiratory infections, wipe out infection-based prostate problems, and much, much more. Despite some negative press about argyria, a condition that results when a person ingests, over a long period of time, improperly-formulated silver solutions that have been prepared with silver salts and consequently receives a blue pigmentation in the skin, the truth remains that properly prepared silver solutions made by electrically-generated ions is an extremely safe and potent disease preventative as well as nutritional supplement. Warning: Please use safely, responsibly and only as directed. Be sure to purchase quality silver from a trusted manufacturer.